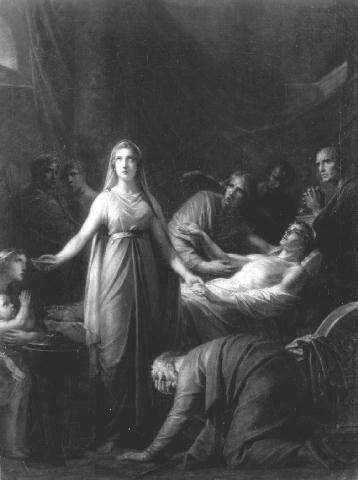 Among the most remembered and favoured characters of Greek mythology is Alcestis. She is remembered for her devotion to her husband and the sacrifices she made for him. The story of her life has served as inspiration for some of the World’s most treasured operas and plays. A long time ago, there was a King named Admetus who ruled the small kingdom of Thessaly. The King was widely praised for knowing the name of every person in his kingdom by heart. One night, a traveller appeared at the gates of the palace and asked for shelter. King Admetus knew that he was not local to his kingdom but still warmly welcomed the stranger, and let him stay for the night. Strangely though, despite being warmly greeted by the King, offered clean clothes, food and a bed for the night, the traveller refused these luxuries and instead offered himself in service to the King as a slave. Despite having no need or want for slaves, King Admetus realized that his dismissal of the stranger’s offer was causing him great distress. So, the King accepted him and set him to work as a shepherd. The stranger stayed in the kingdom for a year and tended to his flock, dutifully in service of King Admetus. After a full year had passed, it was finally time for the stranger to reveal his true identity. He was in fact, the God of Light, Apollo. Apollo explained that he was serving a punishment on the orders of Zeus. Zeus had killed his son for attempting to resurrect the dead, a crime punishable by death on mount Olympus. Upon hearing the news and in a moment of anger, Apollo killed the two giants who made the weapons for Zeus. Apollo’s punishment for his crime, was that he had to spend a year as a slave to a human king. Apollo expressed his gratitude to Admetus, and offered to give the King anything that he wanted in return. Admetus, however, refused his offer as he felt he had done nothing to warrant such kindness. Apollo bid his farewell and said that in the future he would return to help the King when he was most in need. Soon after, Admetus fell in love with Princess Alcestis of Iolcus. Despite having many eager suitors due to her renowned kindness and beauty, the princess’s only wish was to become the wife of King Admetus. However her father, King Pelias, was not so convinced, he did not think Admetus worthy of his daughter. 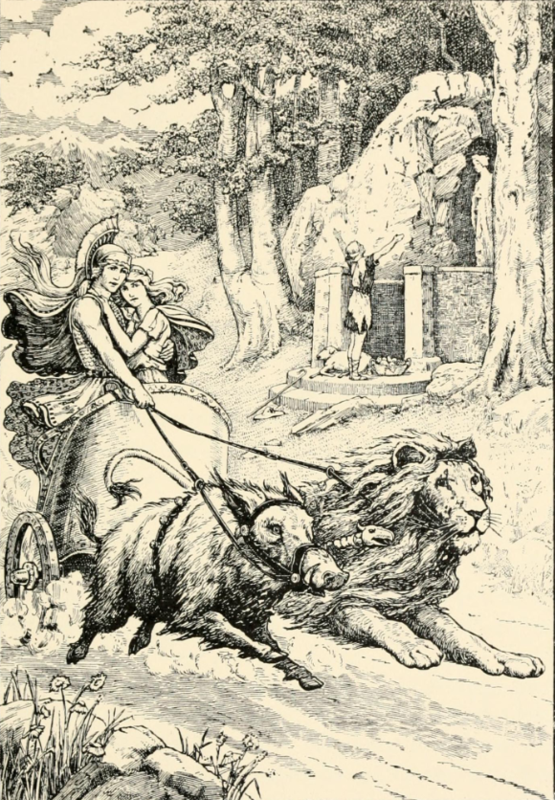 He decided to set Admetus an impossible task, to yoke a lion and a boar to his chariot. If he should success in the challenge he would win the hand of Alcestis. Daunted by the task ahead of him, and unsure of how he would manage it, Admetus suddenly remembered Apollo’s offer. The King called for the God of Light and Apollo appeared instantly, bridling a lion and a wild boar to a golden chariot. Admetus was overjoyed and King Pelias was obliged to keep his promise and allow the pair to marry. King Admetus and his wife lived out their days happily together. 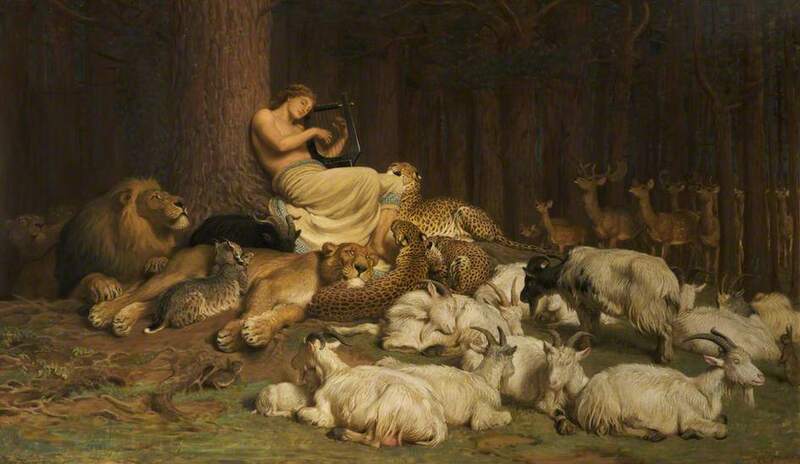 The small kingdom of Thessaly was a happy place, always full of song and welcoming parties. That was, until one day, the King became seriously ill, they feared he would not recover. Out of loyalty to Admetus, Apollo pleaded with the Goddess Fate not to take the life of the King. She agreed, but on one condition, someone else would have to voluntarily die and take his place in the afterlife. Apollo hastily made announcements to the people of Thessaly. Despite their love for the King no-one came forward. Not his elderly parents, who were not long for this world, not the inhabitants of the palace or any of his loyal subjects. No-one had the courage to face death in his place. No-one except for Alcestis. Through her love for him she willingly volunteered. So upon recovering from his illness, King Admetus opened his eyes only to bid farewell to his beloved wife. 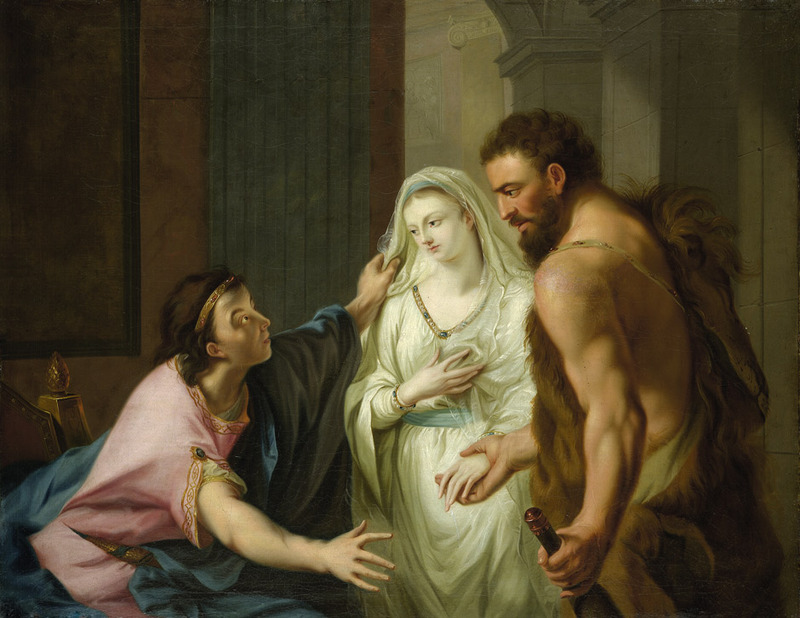 Before Alcestis closed her eyes for good, Admetus swore to her that he would never accept another woman’s love. The King sat next to his wife’s body in mourning and refused to eat or drink for several days. It was at this time, when the hero, Hercules passed through Thessaly. Despite his crippling grief over the death of his beloved wife, Admetus still greeted Hercules with kindness and made sure that he was treated well. 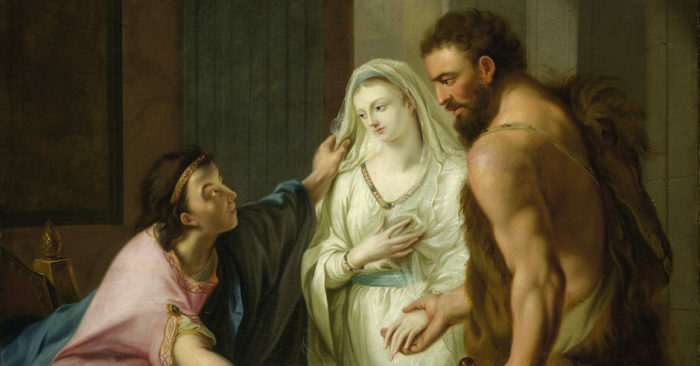 Upon learning of what had happened to the Queen, Hercules was deeply struck by their love for each other and moved by the brave sacrifice that Alcestis had made for her King. 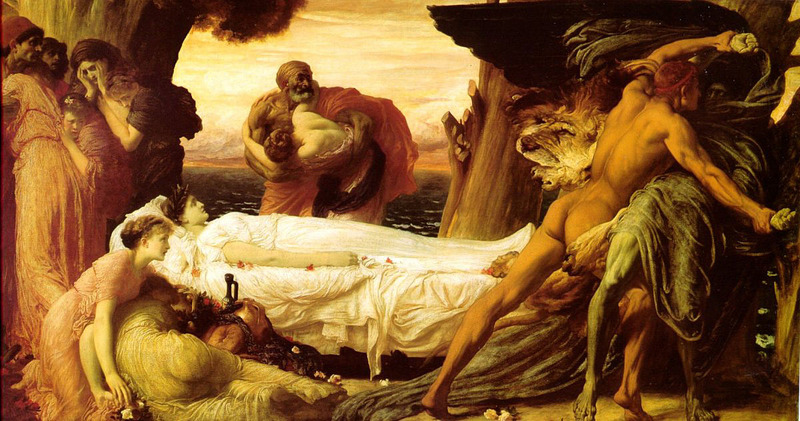 Hercules decided to stand guard over Alcestis’ body, fearful that the God of Death, Thanatos, would come to take away her soul. Thanatos did come, and so Hercules was forced to fight him to protect the body and soul of Alcestis. He beat the God of Death, regained her soul and forced the powerful God to flee in fear. The next morning, Hercules said goodbye to Admetus and presented him with the body of a woman, with a veil covering her face. The hero told the King that he must continue on his journey but asked him to take care of the veiled woman. 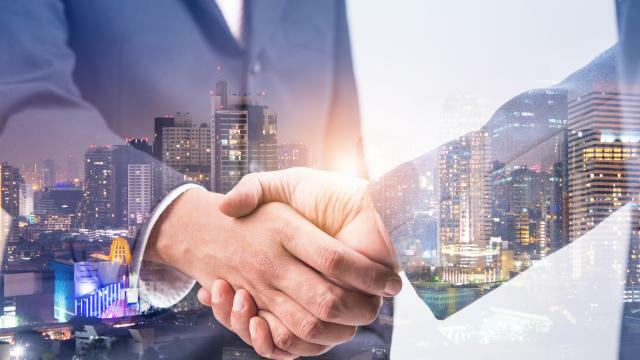 Admetus refused the request and repeated his oath to Alcestis, stressing that he would never betray his beloved wife, nor accept the presence of another woman in the palace. However, Hercules insisted and handed the woman to Admetus. As he left, he turned and told the King to remove the veil from the woman’s face. Upon seeing the face of his wife, Admetus’ joy was beyond words. Alcestis would live as a shadow for three days until her soul had completely returned to her body. But after those three days, the King and Queen would be reunited. For the rest of their days, the King and Queen of Thessaly lived happily together, until Thanatos returned and escorted them to underworld. This time they went willingly and they went together.